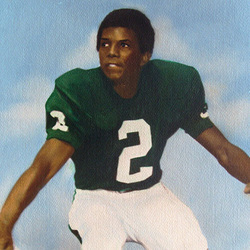 Burgess Owens came to the University of Miami in the fall of 1969 with golden credentials as a speedy running back who had gained more than 1550 rushing and 19 touchdowns in two years at Tallahassee Rickard High School and he wound up his college career with golden credentials with being honored as an All-American. As a 6ft. 3in. freshman he had 13 pass receptions for 161 yards and two touchdowns, ran back seven kickoffs for 130 yards and rushed for 199 yards on 36 carries. New head coach Fran Curci tabbed Owens as a promising sophomore who would be worked in gradually. He debuted in the opener against William and Mary and by the Florida State game, on October 30, 1970, he was the starting cornerback and was never to be dislodged. Miami improved in 1971, but still stayed below .500 , despite the gallant efforts from Owens. He returned 10 kickoffs for 150 yards, and had 5 interceptions, which placed him in the UM record books at 6th for single season interceptions. Owens was a stalwart on defense that year and was named the the Associated Press All South Independent team. Owens was the keystone to the 1972 Hurricane defense which held it's opponents to under 200 points for the first time in several years. He boosted his career interception total to 8 which put him in the top 10 for career interceptions. For his flawless defensive play he was honored as a first team All-American. Capping his colligate career Owens was drafted by the New York Jets where he played several years and then moved on to the Oakland Raiders where he finished a stellar NFL career.